At the war's end, a young woman suffers an accident that leaves her unconscious and alone. Waking with amnesia, she takes the name Mercy and wants more than anything to find out the truth of her past. But then a handsome stranger arrives, who may hold the key to everything she has forgotten. What he knows could devastate her future, and even end her life. This book is available at Life Way, DavidCCook , and many other online retailers. 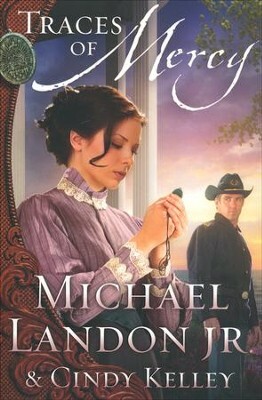 He co-authored this book with Cindy Kelley, author and screenwriter who worked with Landon on Love Comes Softly and co-authored the novel The Silent Gift with Landon. I am eagerly awaiting the release of the next book in this exciting series. It is difficult to tell about the book with out giving much of the story away. So at best I am going to say - Read it! I enjoyed it very much. It kept my attention and the plot is exciting and captivating with its surprising twists and turns. Mercy has many lessons to learn. She also has to learn to trust the Lord with her amnesia and her heart. There is much for the reader to learn also including such things as love, forgiveness, and understanding. I really enjoyed it, and highly recommend it. Labels: 52 books in 52 weeks, book reviews, Christian Fiction, Cindy Kelley, DavidCCook, Historical fiction, Michael Landon Jr.